While the original Shield did not sell extremely well, the Shield 2 hopes to make up for lost chance. The new Shield will reportedly be powered by Nvidia’s next generation Tegra 5 SOC. Nvidia recently demonstrated the power this tiny 2W TDP chip holds by demoing off-screen Full HD real-time renders which had Life like output. The Tegra 5 which will be powered by a custom built Nvidia GPU, with the GPU based on the Kepler architecture which was featured in the 6 series graphic cards by Nvidia and four ARM based CPU’s which may not show a huge improvement in the CPU department but the GPU is made to excel. Nvidia has been catching up to Qualcomm and PowerVR since it released Tegra 2 back in 2010. The Tegra 3 was also not a very powerful product, with the new Tegra 4 Nvidia has equaled Qualcomm and other chip makers in benchmarks. Despite the fact that Tegra 4 has not been popular with device manufacturers except being utilized in the original shield, it has the hardware capability to achieve greatness. It is truly great news to see a 2W chip beat a graphic card which sips 110W from the power socket, proving the exponential increase in processing power. 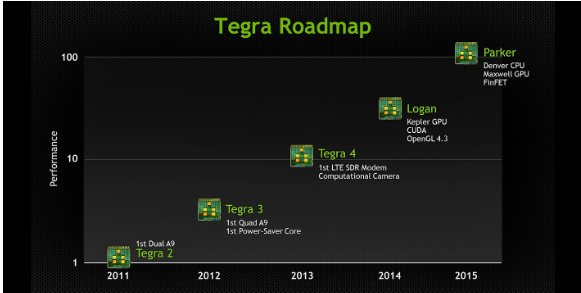 While the Tegra 5 is nearing release in 2014, the next generation Tegra 6 will be a sight to behold. Tegra 6 will reportedly double the graphic horsepower of the Tegra 5 while maintaining a respectable power limit. “We want to get multiple years ahead of the competition” as quoted by huang, the CEO of nvidia. Although we will not see the next generation of Tegra till next year, Tegra 5 was demoed to play Battlefield 3, we only hope that Nvidia brings Pc gaming to mobile devices sooner, Crysis and other games like GTA V on a handheld will be a great experience!